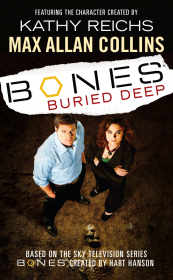 Dr. Temperance Brennan, a highly skilled forensic anthropologist who works at the Jeffersonian Institution and writes novels as a sideline, has an uncanny ability to read clues left behind in a victim’s bones. Law enforcement calls upon her to assist with murder investigations when the standard methods of identifying a body are useless. Brennan often finds herself partnered with special investigator Seely Booth of the FBI’s Homicide Investigation Unit. Booth, a former Army sniper who mistrusts science and scientists, believes the key to solving crimes lies in discovering the truth from good old-fashioned detective work. Brennan’s equally brilliant colleagues at the Jeffersonian’s Medico-Legal Lab include earthy and bawdy Angela Montenegro, who’s created a unique way to render an original crime scene in a 3-D computer image; Brennan’s assistant, Zack Addy, a young prodigy whose genius IQ actually gets in the way of finishing any of the several doctorates he’s begun; “the bug guy” Dr. Jack Hodgins, who’s an expert on insects, spores and minerals, but conspiracy is his hobby; and Brennan’s boss, the imposing lab director Dr. Daniel Goodman.